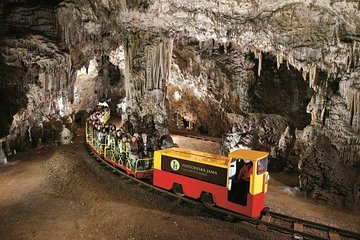 Escape the hustle of Slovenia’s capital city and explore the magnificently carved natural wonders of Postojna cave on a day trip from Ljubljana. Upon arrival, you’ll hop on board an electric train and take a ride deep into the underground labyrinth of tunnels. With a guide, you’ll wander the passageways and galleries to view the bizarre rock formations that make up this karst cave system. On the way back to Ljubljana, you’ll also visit the mysterious Predjama Castle dramatically clung to the side of a limestone cliff.